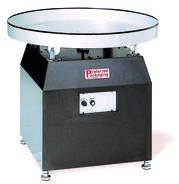 The Model’s of Lazy Susan Turntables listed above are great stainless steel machines when you are trying to accumulate your product before additional packaging, labeling, inspecting or just holding the product until you are ready to unload. The table is 36” in diameter and all come with the variable speed turntable and 0-12 rpms. Optional hinged plexiglass cover can be added over the control panel to improve wash down conditions. The table is 48” in diameter and all come with the variable speed turntable and 0-12 rpms. The table is 60” in diameter and all come with the variable speed turntable and 0-12 rpms.